VSRT turns off battery loads other than starter when starting, or when voltage drops. 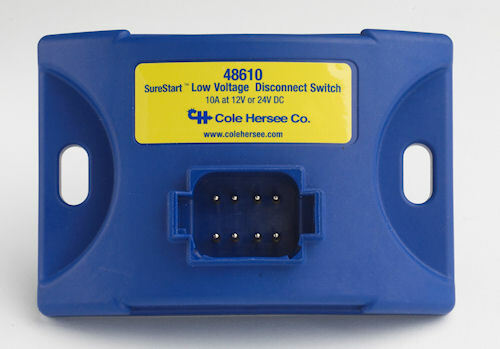 A new voltage sensing relay and timer from Cole Hersee gives farmers, equipment operators and passenger vehicle drivers a leg-up on dead batteries with its ability to shut off battery loads when voltages drop. The FlexMod VSRT turns off auxiliary circuits when a vehicle is started, or when a pre-set timer times out, or when voltage in the battery drops to a low level. Many times when a vehicle is left idling with onboard loads remaining powered, a battery can become deplinished to the point the it can't service the starting circuit. Automatic shutoff of auxiliary battery load is possible with Cole Hersee's new voltage sensing relay and timer. The FlexMod VSRT can virtually eliminate most dead battery surprises. The FlexMod alerts the operator when starting voltages are low and then temporarily cuts off any non-essential electrical loads, conserving amps to start the vehicle. The solid-state accessory measure 4X3X1" and has a service life of more than a million on/off cycles. It is rated at 10 amps and handles loads from direct circuits or it can drive solenoids and relays for higher current accessories. For more information on the VSRT, call (617) 268-2100, or visit www.colehersee.com.